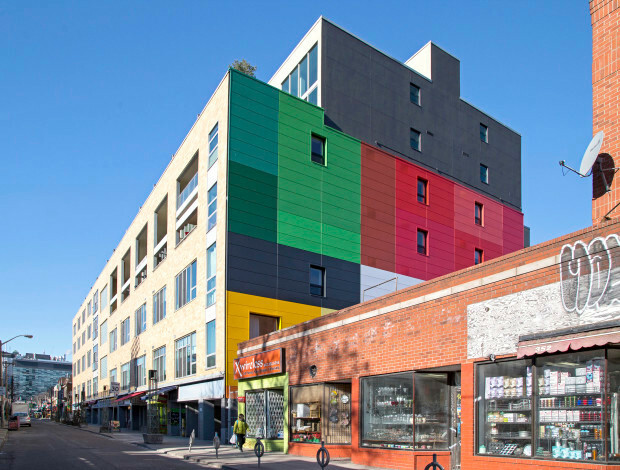 ERA Architects’ objective was to leverage a required façade remediation and upgrade for a residential loft building as an opportunity to provide a visually arresting gateway; working collaboratively to develop a design that responds to the unique character of the neighbourhood within the city. The result is a new rainscreen system comprised of 246 metal panels, located between the second and fifth floors of the façade. The system spans the full 25 meters of the wall’s length, with a depth of 180mm, including substructure. 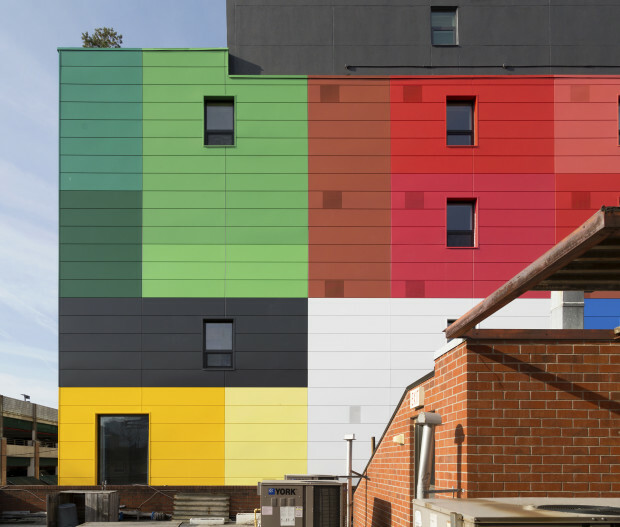 The panels are coated in 17 different colors using a high-performance fluoropolymer coating process. 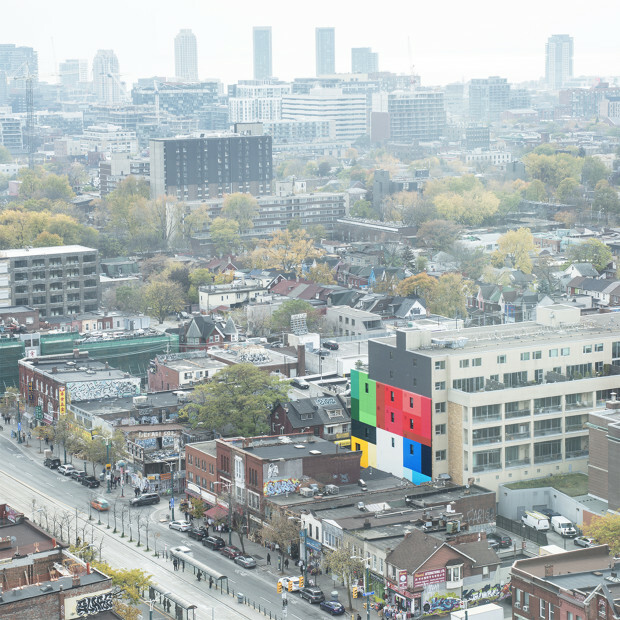 Kensington Market is one of the most culturally diverse neighbourhoods in Toronto, with a long history of fostering an organic, eclectic mix of sights, sounds and tastes within the context of a relatively low density, residential building stock. 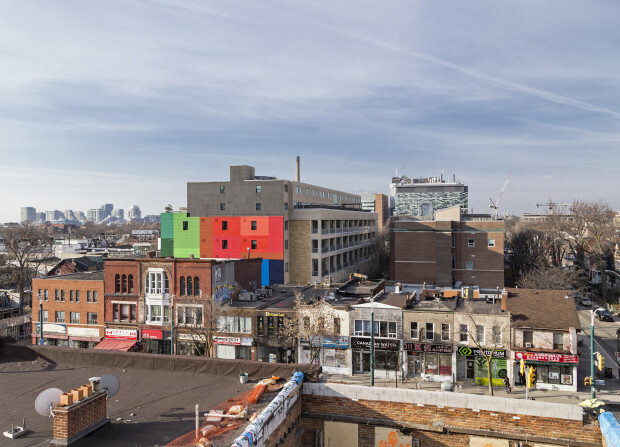 The project team determined that the installation of a wall-mounted public art piece would embody the rich textures and inclusivity of the neighbourhood, creating a ‘gateway’ to the cultural heritage landscape of the market while protecting the remediated underlying steel structure and masonry. 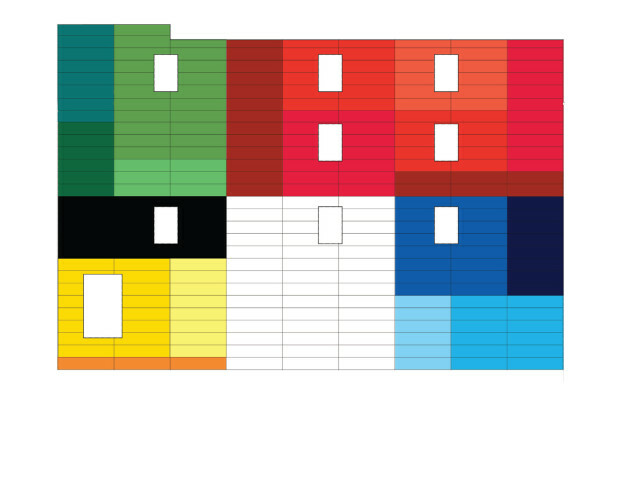 A prominent Toronto artist and area resident developed the colour pattern of the panels with the intent of depicting an aesthetic that reflects the neighbourhood’s historic diversity. The distribution of the colours in the final pattern was drawn from an analysis of the percentage of colours present in the world’s national flags; the material sits comfortably within its bohemian context. It was important to pursue a strategy that did not feel out of place with the vibrant coloured awnings and shops spilling out onto the street. 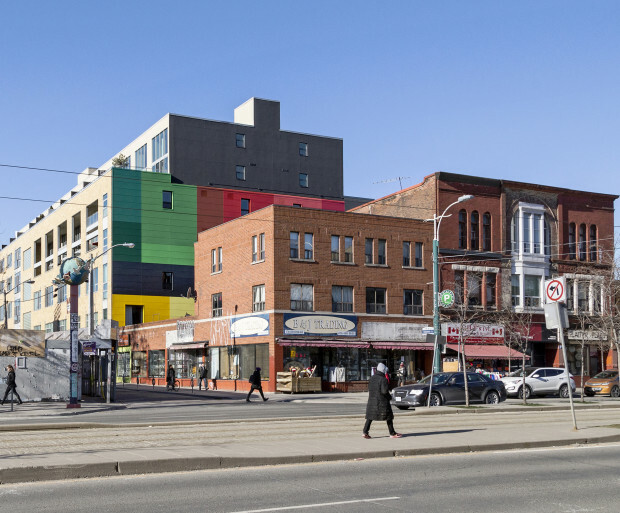 The project embodies its physical location, facing one of Toronto’s most important thoroughfares, to provide a landmark that will invite people into the market at one of its primary entrances. Located at 160 Baldwin Street, the building which currently functions as residential lofts was built in 1952 by George Brown College to house their technical school, and was clad in glazed yellow terra-cotta blocks. Due to a lack of available replacement stock for the original blocks, as well as the particular environmental considerations of the largely exposed east facing façade, the firm determined that the appropriate approach at this location was to develop an overcladding strategy to ensure that the remediated steel structure will remain dry.